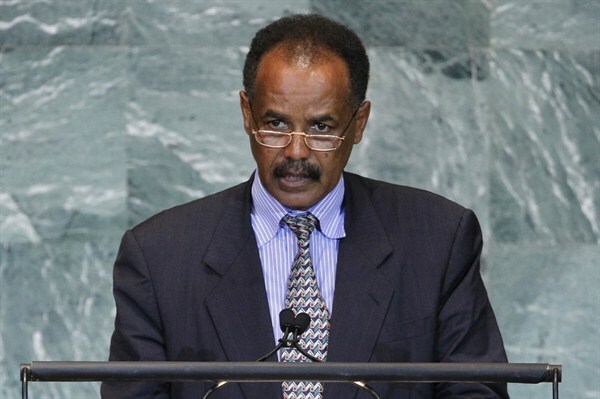 President Isaias Afwerki of Eritrea addresses the 66th session of the United Nations General Assembly at U.N. headquarters, New York, NY, Sept. 23, 2011 (AP photo by Jason DeCrow). On July 22, thousands of diaspora Eritreans from across Europe protested in front of the Palais des Nations, the United Nations’ office in Geneva, against a recently released report by the U.N. Human Rights Commission (HRC). The report details grave human rights violations, including arbitrary arrest, torture and forced labor, which could represent crimes against humanity. If confirmed, this would result in Eritrea being referred to the International Criminal Court. In the view of the demonstrators who protested against this characterization of their country, Eritrea is being demonized by an international system that never wanted Eritrea to be an independent state in the first place. The current government, as these protesters see it, is trying its best to develop the country with limited resources and under the constant threat of its biggest neighbor and former occupying power, Ethiopia.